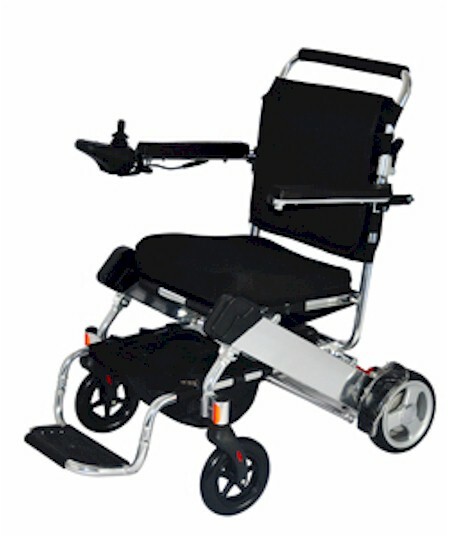 This is a powerful motorized electric wheelchair with a top speed of 5 m/h. Can be folded within two seconds, made from the highest quality aircraft alloy to last forever. Why is this Electric Powered Mobility Wheelchair a better investment than the other electric wheelchair on the market? 1/ This mobility scooter has a 40 amp brushless motor controller, so there is no need to change the brushess ever. 2/ It is equipped with Two 200W motor on the rear wheel to ensure great power distribution. 3/ For your safety, it also comes with a wheelie bar to prevent tipping backwards. 5/ The electric scooter comes equipped with two rear shock absorbers on the frame to make riding your scooter on grass, dirt and uneven surface possible. 6/ The Intelligent assistant system with magnetic technology to provide outstanding safety standards that you can rely on. 9/ Large seat (17″ x 17″) to ensure enough comfort for everybody. 12/ Convenient Shipping. We deliver your electric wheelchair to your door and not to a freight station. Unfolded Dimensions (LxWxH) 34 in. x 24 in. x 36 in. Folded Dimensions (LxWxH) 23 in. x 13 in. x 27 in. Seat Dimensions (L x W) 17 in. x 17 in. Seating Height (from ground) 20 in. Arm Rest Height (from ground) 28.25 in. Front Wheels (diameter x width) 7 in. x 2 in. Rear Wheels (diameter x width) 8 in. x 2 in. NEW! You can choose the PowerBooster to get the1000 Watts Power for only $289.50! This option can be added on the order page. It cannot be added to your scooter after it has been shipped.